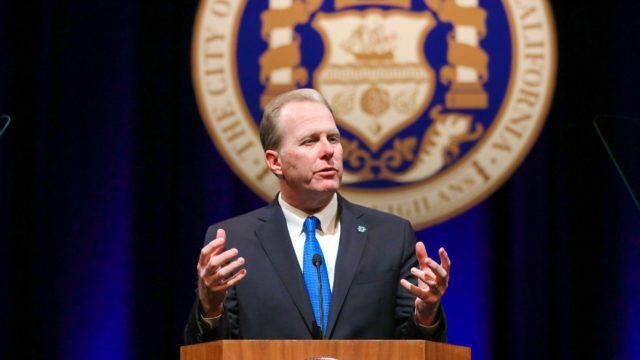 San Diego Mayor Kevin Faulconer unveiled his proposed budget for fiscal year 2020 Thursday, which includes the highest infrastructure investment in the city’s history. The proposed $4.15 billion budget is a 19.5 percent increase over the city’s fiscal year 2019 budget. Despite the spending hike of nearly $700 million, Faulconer touted the budget for its balance due to an estimated $15.3 million in cuts to various departments like storm water channel maintenance and tree trimming services, which would be limited to palm trees. According to the mayor’s office, the city saw only moderate revenue growth over the last year, which it partially blamed on a 1.3 percent year-over- year decline in hotel taxes. However, the city is projecting revenue growth of at least 3 percent from property, sales and hotel taxes in the upcoming fiscal year. The budget includes an infrastructure investment of $715.8 million, an increase of nearly 300 percent over the $179.4 million infrastructure allocation in the city’s fiscal year 2014 budget during Faulconer’s first year in office. The funding includes a portion to begin construction on the city’s Pure Water program, which city officials say will produce one-third of the city’s drinking water by 2035. Faulconer also proposed $36.2 million in funding for homelessness services and programs, $6.3 million for the city’s Clean SD climate improvement initiative, $11.9 million to improve traffic safety and achieve the city’s goal of eliminating fatal traffic accidents and $800,000 to study the city’s percentage of hiring businesses owned by women, people of color and other underrepresented groups. In addition to Thursday’s unveiling, Faulconer will present the budget to the City Council during its Monday meeting. The council plans to hash out the finer details of the budget and take public feedback on its contents over the course of two weeks in early May, when its Budget Review Committee will meet. The city is required to adopt the budget by June 15.